Let’s be honest – supporters of the Democratic ticket are living in a bit of a glass house this week. Many of us threw stones at the Republican National Convention – for its drama and at times a debacle of organization and unity. Its convention has already been filled with a roller coaster ride of highs and lows that began with the resignation of Debbie Wasserman Schultz, chairwoman of the Democratic National Committee. The booing by her own Florida delegation as a result of the release of thousands of internal email exchanges among Democratic officials put a few more nicks in our windows. By noon on Monday I was already exhausted by convention coverage. Things got dicier when former presidential contender Bernie Sanders told his supporters, “We must elect Hillary Clinton.” Emotions were running high, especially in the midst of the latest email scandal. Sanders continued his speech by describing how he helped shape what he calls the most progressive democratic platform in history. With a loud and vocal “Bernie or Bust” movement chanting throughout the first day of the convention, it left us all to wonder if Bernie supporters were willing work to elect progressive candidates moving forward. But even with all of the lows – I saw more of my values and beliefs reflected in this glass house. This is a very different convention from last week, focusing on issues that mattered to me – as a woman, daughter of a disabled parent and as a voter who feels like our definitions of “us” keeps getting frighteningly more narrow. I thought pop star Demi Lovato was just there to sing her hit song “Confident.” But she came to the stage and asked for greater access to mental health care. “Like millions of Americans, I am living with mental illness,” she said into the microphone. I’m sure she has performed for huge crowds before, but she looked nervous. Having opened up in the past about her struggles with bipolar disorder, as well as eating disorders and substance abuse, she simply told us, “But I am lucky. I had the resources and support to get treatment at a top facility. Unfortunately, too many Americans from all walks of life don’t get help, whether they fear the stigma or cannot afford treatment.” In the past, Lovato has called Clinton an inspiration for confident women-and I was so glad she could find the strength to bring her message to the stage. 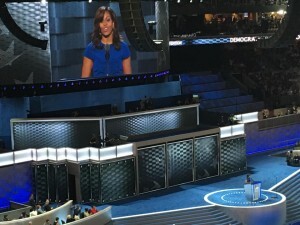 The first glimpse of unity came with the speech from First Lady Michelle Obama. I love the first lady’s campaign advocating for educating young women all over the world. She recently upped her “cool factor” with James Corden’s popular Carpool Karaoke where she used that as a platform to support education for future generations. 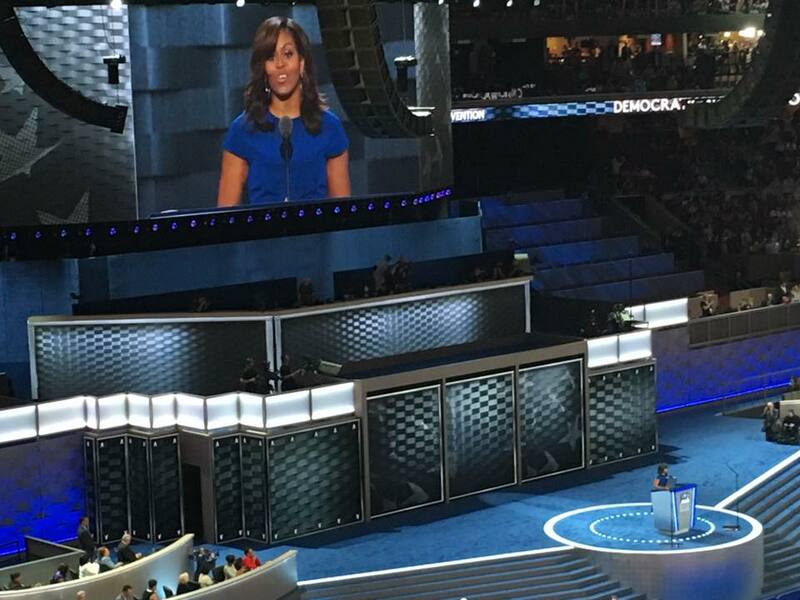 In Michelle’s heartfelt case for Hillary it became clear the advocate for women, young girls and children worried we might squander another opportunity to make history. There seemed to be a hush over the arena as she reminded the world of the magnitude of raising her daughters in house built by slaves. “I wake up every morning in a house that was built by slaves,” she said. “And I watch my daughters, two beautiful, intelligent, black young women, playing with their dogs on the White House lawn. And because of Hillary Clinton, my daughters and all our sons and daughters now take for granted that a woman can be president of the United States. So, don’t let anyone ever tell you that this country isn’t great, that somehow we need to make it great again, because this right now is the greatest country on Earth.” As an African American woman who built a house on land that was once a plantation, I get it. It’s going to be refreshing to hear these types of hopeful messages throughout the week leading up to Hillary Clinton laying out the agenda for how her administration will get things done! There is a glimmer of hope for those getting weary. After a brutal campaign season, a violent summer, a Republican Convention that even Conservative New York Times Columnist David Brooks referred to as “dark,” more protests, more email scandals and another seemingly divided convention, we needed a few days to take a break from politicians throwing stones and focus on real issues. In the words of Mrs. Obama, “Our motto is, when they go low, we go high.” We should take her advice, after all, we going to have to climb a pretty big wall if we want to shatter that glass ceiling.